Is there a science to love? 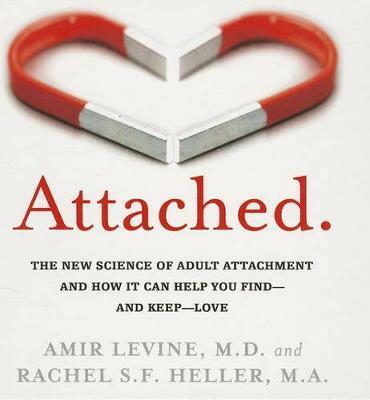 In this groundbreaking audiobook, psychiatrist and neuroscientist Amir Levine and psychologist Rachel S. F. Heller reveal how an understanding of attachment theory - the most advanced relationship science in existence today - can help us find and sustain love. Attachment theory forms the basis for many best-selling books on the parent/child relationship, but there has yet to be an accessible guide to what this fascinating science has to tell us about adult romantic relationships - until now. Attachment theory owes its inception to British psychologist and psychoanalyst John Bowlby, who in the 1950s examined the tremendous impact that our early relationships with our parents or caregivers has on the people we become. Also central to attachment theory is the discovery that our need to be in a close relationship with one or more individuals is embedded in our genes. In Attached, Levine and Heller trace how these evolutionary influences continue to shape who we are in our relationships today. According to attachment theory, every person behaves in relationships in one of three distinct ways: "anxious" people are often preoccupied with their relationships and tend to worry about their partner's ability to love them back. "Avoidant" people equate intimacy with a loss of independence and constantly try to minimize closeness. "Secure" people feel comfortable with intimacy and are usually warm and loving. Attached guides listeners in determining what attachment style they and their mate (or potential mates) follow. It also offers a wealth of advice on how to navigate relationships more wisely, given a listener's attachment style and that of his or her partner. An insightful look at the science behind love. Amir Levine, M.D. is an adult, child, and adolescent psychiatrist and neuroscientist. He graduated from the residency program at New York Presbyterian Hospital/Columbia University and for the past few years Amir has been conducting neuroscience research at Columbia under the mentorship of Nobel Prize Laureate Eric Kandel. Amir also has a passion for working with patients and it is in this context, while working with mothers and children in a therapeutic nursery, that he first discovered the power of attachment theory. Amir lives in New York City. Rachel Heller, M.A. studied at Columbia University with some of the most prominent scholars in the field of social psychology. She now works with families and couples as a psychologist in private practice. Rachel lives in Israel.